What is Dine and Donate? Visit great local restaurants, meet up with other Proctor families, get the night off from cooking (and cleaning up!) and support the PTA’s general fund! Mark your calendar or digital calendar with the second Tuesday of each month- Dine and Donate Tuesdays! There’s a calendar of restaurants below. Please note, the events also appear on the master calendar located here. Watch for the Dine and Donate banner on the fence to remind you: This Tuesday- a night out! Either download and print a flyer, or click and carry the .pdf on your device. Show the flyer at the restaurant when you pay the check. 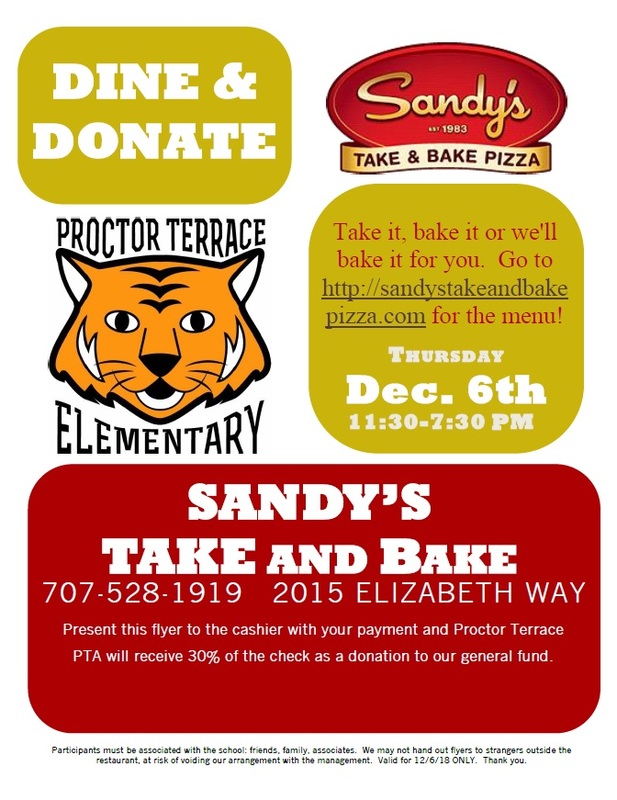 The restaurant will donate between 15 and 30% of your check to Proctor Terrace PTA! It’s an easy way for you to support our School! See you there, Dining and Donating!